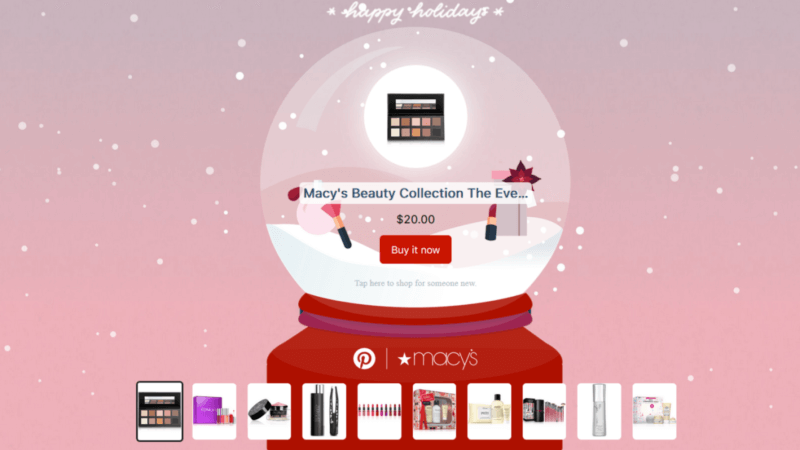 Pinterest is giving a handful of brands special gift-finding tools to help with their holiday strategies on the platform. Macy’s, Lowe’s and Kohl’s have all launched Pinterest “gift globes,” and the company partnered with Etsy to develop “The Etsy Gift Guide” — all tools designed to deliver a personalized shopping experience. Retailer Gift Globes. 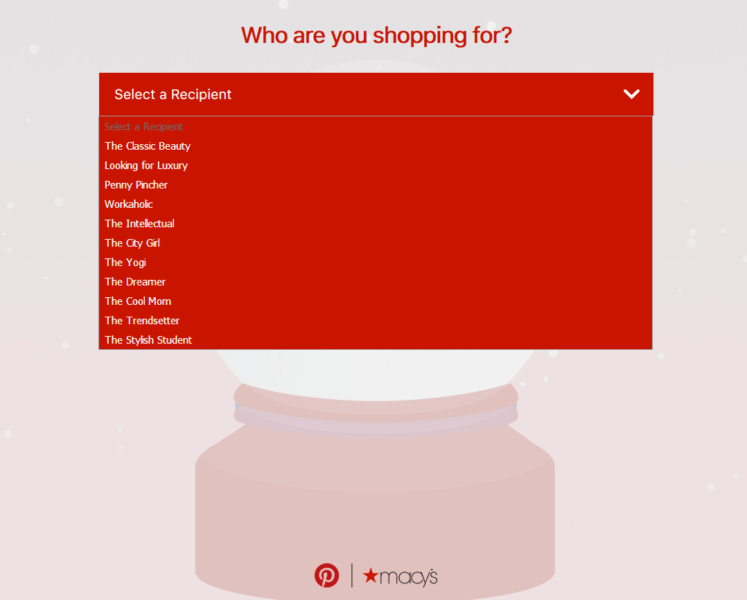 Pinterest partnered with Macy’s, Lowe’s and Kohl’s to design a special gift-finder tool to help users find gift ideas. Users enter who they are shopping for, and the gift globes deliver a personalized list of gift options from the retailers based on criteria. To surface more gift ideas, users can shake their phone on the mobile version of the app, and the gift globe will display new product options. Clicking on the “Buy now” button listed under the product will launch a purchase page within Pinterest. To promote the gift globes, each of the three brands used Pinterest Promoted Videos at maximum width or Promoted Pins to drive more users to their customized gift globe platform. The Etsy partnership. Pinterest has also designed an “Etsy Gift Finder” to help Pinterest users find items from the handmade-centric marketplace. 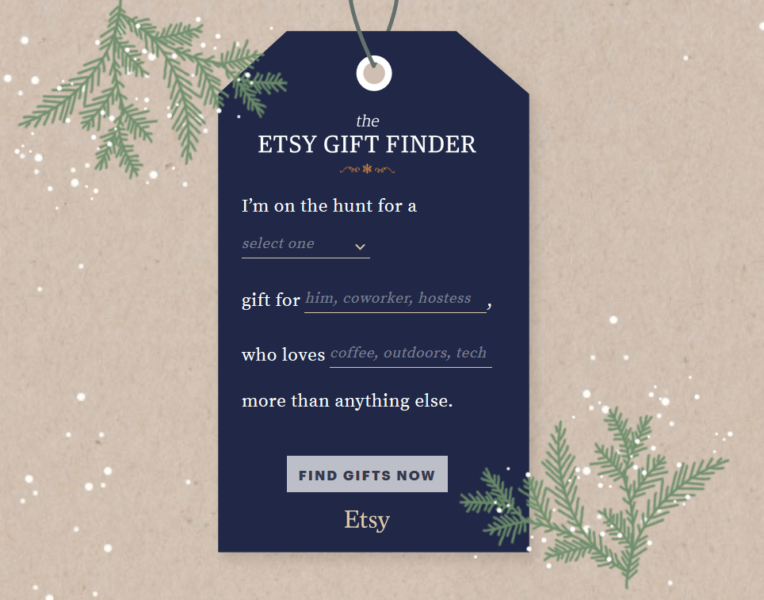 Similar to the gift globe, the Etsy tool lets shoppers complete a virtual gift tag that helps narrow the type of gift they’re looking to find. The virtual gift tag leads to an Etsy personalized product page where users can purchase items directly from the marketplace. Like Macy’s, Kohl’s and Lowe’s, Etsy is using maximum-width Promoted Videos and Promoted Pins featuring the gift finder to drive more Pinterest users to the platform. Why it matters. 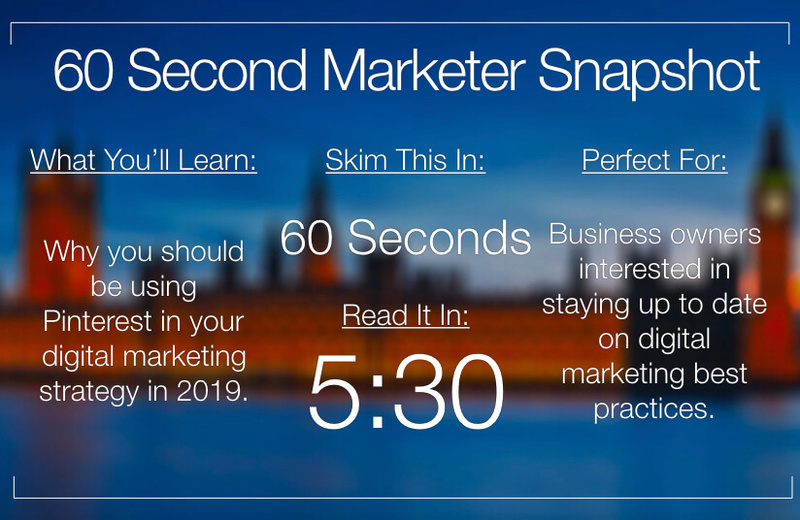 Jacqueline Ball, lead creative director and digital strategist for Sozoe Creative digital marketing agency, says Pinterest is underrated for retail marketers. “Between its recent partnership with Etsy to develop The Etsy Gift Finder and major retailers Kohl’s, Lowe’s and Macy’s to create Gift Globes, Pinterest is set to dominate the holiday shopping season. Traditionally, Pinterest has been one of the most underrated social media platforms for marketers, and these partnerships are evidence that some brands have caught on to this secret,” says Sozoe Creative’s lead digital strategist. In a survey of Pinterest users conducted by Toluna, 87 percent of participants said Pinterest helped them find the right products for the holidays last season. Pinterest’s partnerships with these brands help deliver more personalized shopping experiences for holiday shoppers.